Vintage Sunflower shower curtains from fine art photographer Edward M. Fielding are now available. Customize your bathroom decor with unique shower curtains designed by artist Edward M. Fielding. Made from 100% polyester our designer shower curtains are printed in the USA and feature a 12 button-hole top for simple hanging. The easy care material allows for machine wash and dry maintenance. Curtain rod, shower curtain liner and hooks not included. Dimensions are 71in. by 74in. My cell phone takes great photos and my new stove cooks great food! Ever hear this one? “My new cell phone takes great photos”. If you ask me that’s about the same as saying “My new stove cooks great food”. Or maybe its like “my new table saw makes great furniture”. Or that “new pencil” I bought makes great artwork. Oh and by the way, that new computer I bought writes fantastic stories. You should see the elegant proses and thoughtful plot development it creates. Seriously, I have been in situations where I’ve shown my photographs to someone and the first thing out of their mouth is “I’ve got to get a new camera”. Huh? Did the camera hike through that snow covered field, choose a low angle and decide to use shallow depth of field all on its own? Can you imagine walking out of a great restaurant and saying “That was a fantastic meal, I’ve got to renovate my kitchen”. No doubt the backbone of the photography industry from the equipment manufacturers to the book and magazine publishers who push products and camera reviews is based on the notion that a large majority of “photographers” are just waiting for the right camera, lens, accessory etc to come along which will magically transform their photography to the next level. Some how its the equipment rather than a developed eye that is holding them back from greatness. A better approach to learning better technique and artistry is to stick to what you have and work to produce the best images you can. Start with a basic camera and a standard lens. Work that equipment until you know all of its qualities, limitations, strengths and weaknesses. Then forget about the equipment and concentrate on the art and what you are trying to say with your work. Plenty of famous photographers build their entire lives work around a single camera or focal length. A new camera or new lens brings excitement to the amateur photographer who pulls their camera out of the closet a couple times a year when its vacation time. A true photographer is constantly looking, seeing and capturing life all around themselves. They are not looking for the “convenient” solution, they use the equipment that will result in capturing the story they are trying to tell. I just released two new images in a limited edition printed on wood. Printing on wood makes each piece a one of a kind because the wood grain shows through on the final print. The pieces are ready to hand without need of a frame. The images are Vintage twin lens reflex camera and Eerie Eyeballs. Available for purchase over the next 30 days. Available from the Etsy shop “Dogford Studios” which is run by photographer Edward M. Fielding. This article is a trick, because the secret to becoming an overnight success actually involves many years of preparation. For every story of “overnight success” the back story really involves years of preparation, dedication to craft and building a foundation for eventual success. The problem with overnight success is if you don’t have any second act. If you are simply a one hit wonder who rockets to the top of the charts only to become a trivia question a year later. To sustain a long term career its much better to build a body of quality work and gradually build a following. Then when the mainstream, network TV and People magazine types “discover” you, you’ll have a deep inventory of quality product. You’ll also be better prepared for the spotlight that shines on celebrity. How many stars seem to crash and burn under the pressure of their success? Micheal Jackson with his zany Never-land world, Justin Bieber’s career killing antics or people like J.D. Salinger who simple cracked under the public spotlight and end up living like hermits. Rather than focusing on becoming an overnight sensation, the wise artist seeks to develop a career and it all starts with laying out goals and plans to reach those goals. Create goals for yourself on a timeline six months, one year, five years and ten years out. Be very specific about the goals you want to achieve in the short term and make plans on how you mean to achieve these goals. As you reach the end of each time period, reevaluate the goals and the plans. Check off the ones you’ve achieved, pat yourself on the back and adjust your timeline, plans and goals. Make sure the goal you are working for is something you really want, not just something that sounds good. A goal can not contradict any of your other goals. Write your goal in the positive instead of the negative. Write your goal out in complete detail. By all means, make sure your goal is high enough. Keep in mind that it takes at least three years to get any new business venture off the ground and conversely most people give up and move on to something else within the first year. Make your goals three years out and stick with it knowing that you will be successful if you stay the course. Does it feel strange to have to give directions to someone in this modern age? In the age of smartphones and GPS units? Well whenever I have to give directions to someone, like the gravel delivery man or a lumberyard delivery (for some reason these guys just do it old school), I have to tell them to travel through “Downtown Metropolitan Etna and then look for the SECOND Dogford Road. Not the one buy the cemetery but the one past Hanover Center green. And don’t miss it because then you’ll be cursing me when you end up in Lyme. You see Dogford Road is a five mile loop with two entrances on Hanover Center Road. Plenty of times I’ve had a UPS driver or someone mutter under their breath about driving the long way around. Hey, at least its a scenic trip past beautiful farms and woods! Back to Downtown Metropolitan Etna, what’s there you might ask? Why gives it such a lofty nickname. Well long before Hanover, NH became such a bustling little village with all of its stores, restaurants and Dartmouth College, Hanover Center was the center of town. Hanover Center today is just a big white church, a green where they have Oxen pulls and charity auctions and an old car parade each summer at Founder’s Day, a cemetery and bunch of nice old houses around the green. In other words a whole lot of nothing. Etna Center in contrast is the big city. It sports a post office inside the old school house, a branch of the Hanover library and a general store where you can get anything from a hot lunch, coffee, beer, sandwiches and even video rentals. There is also a B&B and some beautiful houses. Etna, originally named “Mill Village”, is a small unincorporated community within the town of Hanover, New Hampshire, in the United States. It is located in southwestern Grafton County, approximately 3 miles (4.8 km) east of Hanover’s downtown and 2.5 mi (4.0 km) south of the village of Hanover Center, on Mink Brook. Etna has a separate ZIP code (03750) from the rest of Hanover, as well as its own fire station, church, and library. Commerce revolves around the Etna General Store and the Etna Post Office for the 814 residents and occasional visitor in what a small blue-and-white sign in a yard along the main road humorously calls “Metropolitan Downtown Etna”. The Appalachian Trail passes a mile or so north of the village before it turns northeast to cross Moose Mountain on its way to Lyme. Etna can be accessed from NH Rt. 120 via the Greensboro Road or Great Hollow Road (Etna Road, north of the Lebanon exit from Interstate 89), or from Hanover via Trescott Road (E. Wheelock Street). Etna was the site of the 2001 murders of Dartmouth College professors Half and Susanne Zantop, dubbed the Dartmouth Murders. Notable Residents include C. Everett Koop, 13th U.S. Surgeon General, Jodi Picoult, author (My Sister’s Keeper, The Pact, and Nineteen Minutes), Mary Roach, non-fiction author, Edward Fielding fine art photographer, author The Last Resort photographs of Maui. 100th Sale on Fine Art America! 100th Sale on Fine Art America – Let’s get this party started! I joined Fine Art America back in the summer of 2011. I didn’t know what to expect. At the time I was just coming off of an exclusive contract with Dreamstime the stock agency to product images for the commercial market. Bright, happy, clean photographs to be used to sell products. The exclusiveness of the contract meant that I could not sell my images anywhere else except directly through my own gallery. Well, my experience with Dreamstime was a great learning experience. I learned how to technically create images with perfect focus, little shadows and no noise. Technically great but artistically, kind of boring. When it was time to move it to different directions I said good by to the contract and took a financial hit that took me at least six months to recover. I put my images up on several print on demand outlets including DiventArt, Red Bubble and Society 6 in addition to Fine Art America. I also started building a Rights Managed portfolio on Arc Angel for the book cover market. At first I had no idea what I was doing in the fine art market. I selected a group of images I felt were “fine art” and put them up like it was a gallery show or something. I left them there and moved on other things. Later I figured out that fine art means “stuff people want to put on their walls” and this was liberating. I started to craft a style with elements that I like. Simple and clear images (I learned this from the commercial work) with a pinch of nostalgia and vintage feel and style. Style is a no no in the commercial stock world for the most part. They reject anything with an artistic look. Deep shadows, shallow depth of field, black and white, HDR, toning, texture – these are all the things that will get you rejected from the world of stock. Yet in the fine art arena these are things that people who buy art to display love to see. So I blended the two influences. The third ingredient I learned to add is storytelling. A bit of mystery, intrigue and cinematic story telling is what the book cover market is looking for and so does good photography. I’ve been developing this aspect of my photography both for my Arc Angel portfolio as well as my fine art offerings and it seems to be working. I just had my 100th (and then right after 101, 102, and 103) sale on Fine Art America which brings me great joy because unlike the microstock world, the fine art world actually pays an artist for their value. Fine art is where an established artist can actually make a decent return on their work and it feels like I’m headed in that direction. I have four photographs in this art show at the Whitney Center for the Arts in Pittsfield,MA coming up in March 2014. If you are any where near Western MA, come check it out. 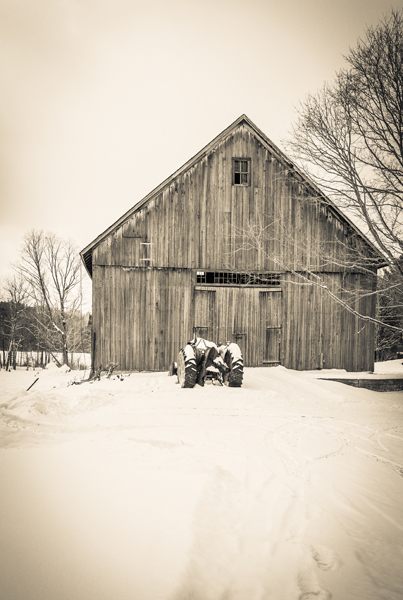 The four images are part of my ongoing series on local maple sugaring production in New England.